Gabriel is using Smore newsletters to spread the word online. There are many people that came before us. We all come from a group called Hominini. Theirs 4 i know from the top of my head they are (these are in order) Australopithecus, Homo Habilis, Homo Erectus, and Homo Sapiens. Scientist believe the first ape two go in the wild was Lucy she was the first two be bipedal. She was a Australopithecus. She was 4 feet tall and weighed 110 pounds. She had a small face, small canine teeth, and she consumed fruit, nuts, insects, and small mammals. Homo Habilis is "tool man". They call him these because he was the first man to create and use tools like knives and they flaked rocks two make knives. Homo Erectus came after Homo Habilis and they were runners. They stand straight up and had longer limbs that helped them run fast they also figured out cooked meat. This is important because the cooked meat gave them protean and the carbohydrate from the meat made brain cells that made their brain bigger. Homo Sapiens (which are us) are the smartest and most built hominid so far. They had a rounded skull and had a erect posture. They were the first hominid to successfully migrate out of Africa. they migrated because the ice age made Africa to a dead grass land. Archaeologist were "explorers" this means that they only cared about fortune and fame. They didn't care if they broke something or if they steal something. Now archaeologist are more careful then they used to be they take there time. Archaeologist aren't the only people that can find artifacts because some kids found some cave art while trying to find there run away dog. Archaeologist take things into consideration while digging in a dig site. They need to find a good place and a good place to start is in the savannas of Africa. Then find any water sources and civilizations because that's were hominini lived. After that they have to deal with the climate. The worst climate to get is exhausting heat and downpours. Its a struggle for archaeologist to find artifacts with this types of climates. A tool they use are called trowels. These trowels are small like shovels things. Archaeologist use this because they don't break the artifacts. 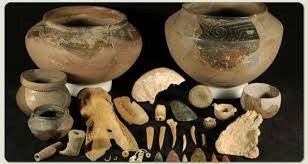 Theirs 6 types of artifacts that can be found : fossils, tools, sculptures, art, pottery, and written records. Some of this artifacts can tell us about the hominid's culture and the technology they had. The reason written records are so important is because they can tell the hominid's feelings and life back then.